Leads must be converted into PEOPLE before they can be converted into dollars. Whoever can do it FIRST has the best chance of winning the sale. The Human Touch: There is no substitute for a real-time connection with a potential customer when it comes to making the sale or inking the deal, and the faster you can make it happen, the better your chances of edging out your competition and winning over the client. They want it now! 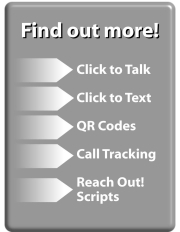 realPING enables your potential customers to contact you EASILY and INSTANTLY via voice or text, with the addition of a one-click button or scan-able QR Code easily added to any web page, e-mail, e-newsletter, blog, classified listing...you name it. People Buy From People: 78% of consumers will select the company or professional who is the FIRST to respond and answers their questions! When it comes to making a connection, getting the edge on your competition and MAKING THE SALE, there's simply nothing like realPING. Copyright © 2019 RealPing LLC - All rights reserved.